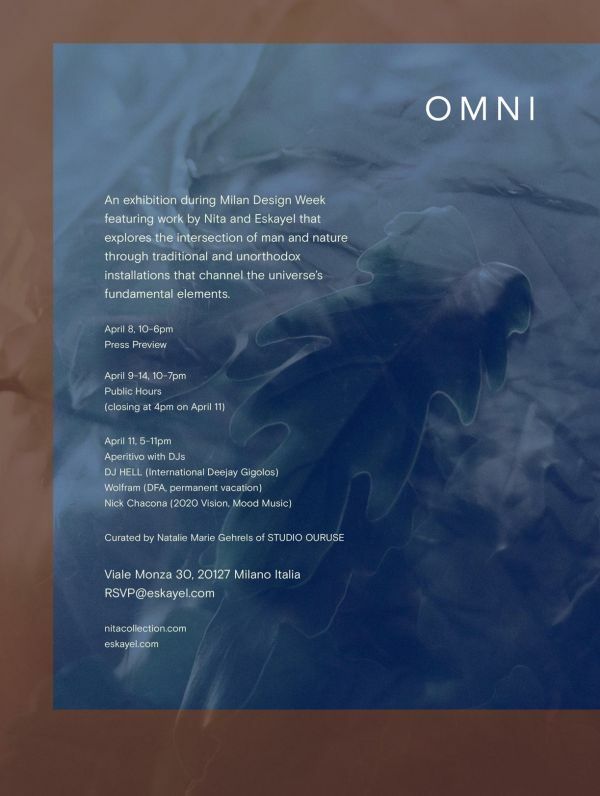 Eskayel and Nita presents "Omni" during Milan Design Week. An exhibition that explores the intersection between man and environment. MILAN, ITALY (APRIL 2019) – Curated by Natalie Marie Gehrels of STUDIO OURUSE, “OMNI,” an exhibition featuring work by Nita and Eskayel, explores the intersection of man and environment through the deconstruction and reconstruction of the featured designs into the universe’s fundamental elements: fire, earth, air and water. Individually, the traditional and unorthodox installations challenge perceptions; as a whole, they illuminate human connections and honor nature as the ultimate source of all creation. This exhibition marks the permanent opening of the Nita showroom. Milan-based Nita’s lighting and home designs blur industrial design and fine art by balancing primary shapes with pure materials that convey a considered purpose, emotion and idea. From modular lamps to illuminated tubes to geometric tables, these sculptural objects assimilate the patterns, techniques and nuances that surround us. They also possess an acute awareness of the importance of an efficient and responsible use of materials, processes and local production. New York-based textile design studio Eskayel introduces “Omaggio,” which means “homage” in English: a collection inspired by a Tuscan-style garden in San Diego cultivated by founder Shanan Campanaro’s Italian-American father. 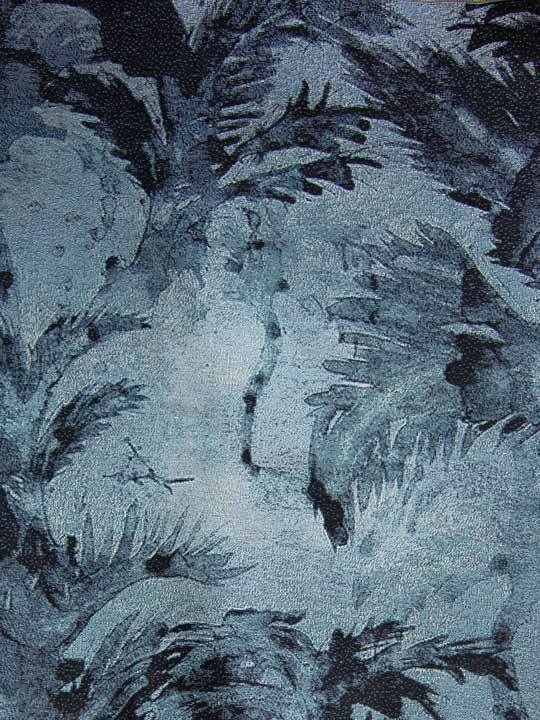 The collection’s designs, originating from paintings by Campanaro, capture the tree- and terracotta-strewn terrain, honoring her father’s heritage and their mutual love of nature. For the exhibition, the designs will be transformed into fabric sculptures, tapestries, rugs and large-scale wall murals. Based in Milan, Italy, Nita was founded by Nicolo Taliani, who unites his European heritage with an ongoing exploration of sculpture and fine art, establishing a unique design language that synthesizes myriad inspirations. From architects Renzo Piano and Le Corbusier to artists Constantin Brancusi, Lucio Fontana and Isamu Noguchi to post-modernism and futurism movements, and beyond, this wellspring combines to inform declarative objects, including jewelry, lighting, furniture and sculpture. Eskayel is a New York-based textile design studio that weaves fine art with exacting craftsmanship. 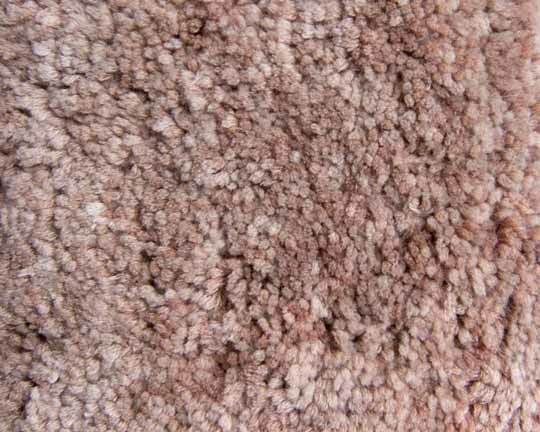 Dedicated to sustainable innovation and lasting beauty, it treats all environments conscientiously. Each of Eskayel’s one-of-a-kind designs originates from a painting inspired by nature or travel and created by studio founder Shanan Campanaro. Using eco-friendly methods, including water-based pigment ink, regional production and sustainably sourced materials, Eskayel evolves these artworks into hand- knotted rugs, wall coverings, home linens, fabrics, furnishings, accessories and more. Working with trusted, transparent production partners, the studio makes each item to order to eliminate stock waste and ensure superior quality.